If you’re a resident of Pinellas County looking for a professional pool services or swimming pool repair, call Triangle today. We’ve been offering our St Pete, Clearwater, Seminole, Largo and Palm Harbor clients quality workmanship for over 50 years. We also have the knowledge and skill required for sustaining the proper function of swimming pools. This area of your yard is one of, if not the most, important amenities of your home. But while it’s a source of fun and leisure, it can also be a lot of work to maintain. Triangle can take care of all your needs, so you don’t have to. Each of our technicians is qualified and factory trained with many years of experience in the industry. You can be sure that all the swimming pool services and swimming pool repairs performed by Triangle are complete with the finest craftsmanship and expertise. We handle all swimming pool repairs and part replacements—pumps, filters, automation, salt systems and motors. We also specialize in heating systems; our licensed gas appliance specialist can deal with natural gas, propane, and electric heat pumps. At Triangle, we specialize in both residential and commercial pool maintenance in St Pete, Clearwater, Largo, Seminole and Palm Harbor. From weekly pool cleaning services to commercial water management—we have the skill and equipment required to clean, repair, and manage any size water feature. We understand that your backyard oasis is a major investment. It’s important you take advantage of all the benefits of having a water feature. However, in order to do so, it’s imperative that you make sure it’s always in the best condition possible. 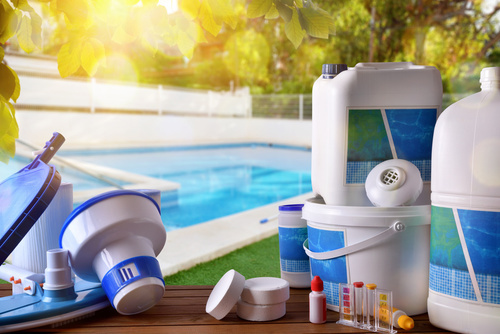 By utilizing the pool services and swimming pool repairs offered by Triangle, you’re guaranteed more time of relaxation around the oasis of your home and less time worrying about the upkeep of it. We can repair any broken valve or pipe. The earlier you fix a problem you’re noticing, the better. You can depend on us for all your needs, not the swimming pool repairs. At Triangle we will put in the necessary work to ensure you have sparkling clean water with the proper chemistry and functioning of all its mechanical components. We offer our customers services based on their specific needs and we make it a priority to make sure each client receives the attention they deserve. We know how much people value their bachyard water oasis because we value them too—which is why we specialize in the proper maintenance of them. The enjoyment you will receive from being able to capitalize on your clean and properly functioning water feature will be well worth the decision to take advantage of a professional pool services and swimming pool repair company. Triangle will ethically, affordably, and adequately take care of all your needs! For more information about the services we offer at Triangle call today to speak with a technician (727) 531-0473. We also offer residential and commercial pool cleaning on a weekly basis! Talk to us about chemicals, supplies, and even commercial water management systems in St Pete, Largo, Seminole, Palm Harbor, and other areas of Pinellas County Florida.